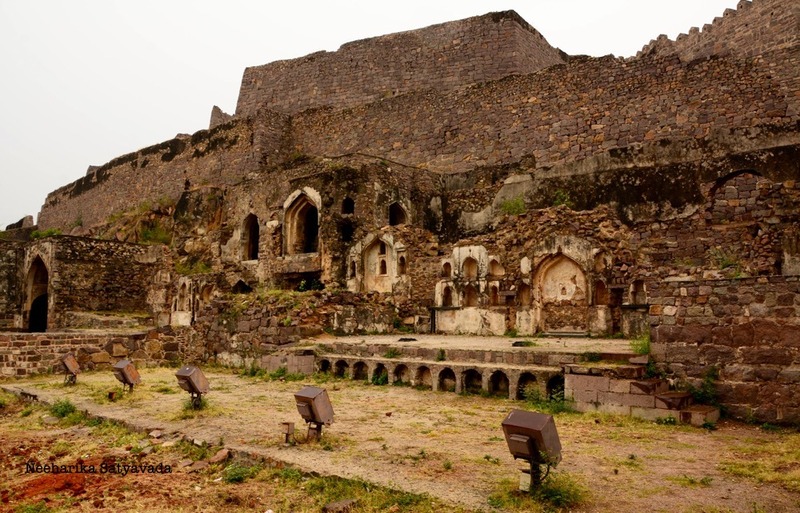 The Golconda Fort is a testament to the history of Hyderabad and this region. Originally a fort of the Kakatiyas, it went through the Bahamanis to the Qutub Shahi Kings, who made it their capital. From the earlier peacock and griffin carvings to the later fort walls with its numerous bastions and battlements bear evidence to this fact. Anyone who has lived in Hyderabad long enough will tell you how important this confluence of Hindu and Muslim cultures has been in shaping not just the city but even its distinctive language! Hyderabadi as it is called (a mixture of Urdu & Hindi) even extends its influence to the local Telangana dialect of Telugu giving it it’s distinctive twist. Built on a hillock 400 feet high, The Golconda Fort derives its name from the Telugu word ‘Golla Konda’ meaning Shepherd’s Hill. Legend has it that a shepherd found an idol here and the reigning Kakatiya King built a mud fort around it. Surrounded by a deep moat, an outer wall and an inner double wall, this Fort was neigh impregnable. Made even more daunting by the cannons mounted on its 87 bastions, Golconda was the strongest amongst the forts of Deccan. It was Aurangazeb who finally managed to infringe the fort in 1687 and it is said that even this was made possible only because of a traitor on the inside. Meandering up the hill, within these fortifications, is yet another stone wall made from the boulders already there. So, this once-unconquerable-now-in-ruins fort is still striking in its architecture. But the truly remarkable samples of the ingenious design and planning that went into the construction of this fort remain the Persian wheel water Supply and the acoustic signalling mechanism. Relying purely on gravity, water was collected from, stored and supplied at different levels of this massive citadel! Every building and wall is positioned in a way that allows sound from the entryway to be carried up to the hilltop. Believed to be a communication mechanism for the guards, one can still experience this by clapping at the threshold and hearing the echo travel. The third feat of engineering in Golconda that has stood the test of time are the archways built in a way to allow cool breeze to circulate through the various palaces and halls, a definite breather from the summer heat of Hyderabad. Other interesting must-sees in this fort complex are the still intact Aslah Khana (3 storeyed armoury), Ramadas Bandikhana (where the legendary devotee of Lord Rama, Bhakta Ramadasu was jailed by the last ruler of Qutub Shahi Dynasty, Tana Shah for surreptitiously ‘borrowing’ money from the royal treasury to restore the Bhadrachalam Temple), Baradari (pavilion on the hilltop), Ibrahim Masjid, Mortuary Baths (in today’s context just beautiful archways built in Persian+Turkish style), Taramati Mosque, Nagina Bagh (once a thriving diamond trade centre as attested by none other than Marco Polo, today, a garden). It is believed that even the Kohinoor was mined here! Things To Do: Get a guide who will take you up the hillock and regale you along the way with intrigues of the court from an era gone by. Watch the Light & Sound Show conducted by the State Department of Tourism, where every evening, the history and romance of this beautiful place is recreated through music and story telling. We were not in touch at all and i happened to come across your website today. I must say nothing gives more happiness to one’s soul than travel to exotic and breathtaking locales ( even more merrier with a good partner). I’ve myself been to some good places, not as regular as u though. Thinking of purchasing a good DSLR soon. With my cell i managed to click some good shots and got my photo shoot done as well. The images you clicked are very soothing and captivating! …Talking about Golconda, i went with my mom and one of our classmates just 6 months back…we loved climbing up till d top while clicking ourselves in great backdrops!………..Lovely seeing you write about it so well along with magnificent pictures. You wont believe she very recently has painted a nice view of the Golconda fort, her painting has come even more livelier than the snap! Lets meet up soon! ….I was myself planning to think of visiting locations and writing….This is far liberating than being chained in usual corporate jobs!…. Looks like a beautiful place……I love these old historic forts!!! Ok…on my next trip to Hyderabad & you will be my guide!! Lovely pictures and a story to match!